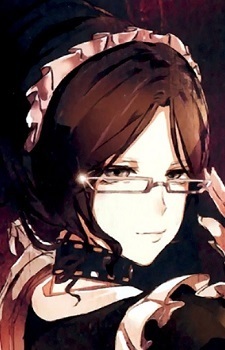 Yuri is the vice-captain of the "Pleiades Six Stars," the battle maid squad of the Great Tomb of Nazarick. She is a beauty with an intelligent look, wearing glasses and a choker. She wears her hair tied into a low-cropped bun at the back of her head. Lacking a metal plate in front of her skirt, her dress emphasizes mobility rather than defense. She is equipped with spiked gauntlets. As shown in her karma value, Yuri is good-hearted and one of the two "safe" Pleiades to humans. Thus, she felt relief when Ainz said not to kill humans without proper reason. When given permission to do as she pleases, she chooses to help people in destitution. She uses "boku" as a first-person pronoun when speaking in private, revealing a somewhat childish nature. Her behavior is strict like a teacher's. Due to her personality, she often works as a chairperson.